Collaborative sound performance project by Slavo Krekovic. 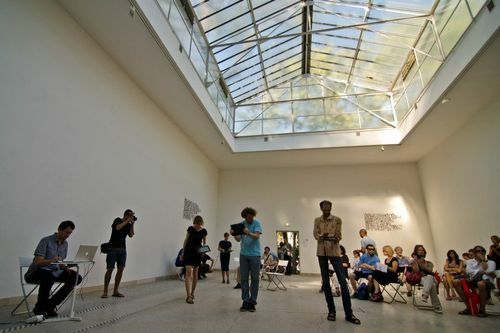 Originally commisioned as ‘Answering Architecture’ performance by Slovak exhibition at the Architecture Biennale 2012. Touch gestures and movements of four players (Touchscreen Orchestra) navigating through the space and operating multitouch tablet computers are sent wirelessly to the central computer operated by the ‘conductor’, that generates and processes sounds for the empty architecture of the pavillon. Since its premiere, the piece has been performed several times with some variations.